The Colorado River, 85% of which is sourced in Rocky Mountain headwaters (Ikeda et al 2010), supplies water to 1 in 10 Americans (US Department of the Interior 2012). Despite the importance of alpine snowmelt, surface flow, and groundwater to a growing Southwestern US population, these fluxes are poorly understood. Complex topography, heterogeneous geology, and steep temperature gradients make catchment-scale process-based understanding challenging. While there is scientific consensus that these regions are more sensitive to environmental changes, there is little agreement within the literature about what the impacts will be for water supply, flood, and drought risks. I use integrated models and HPC systems in my research to improve our understanding of climate impacts to these headwater catchments. I worked as part of a multi-institutional team supported by the Department of energy to build a hyper-resolution model over the largest extent to-date in complex terrain- 10m resolution across the 255km2 East River basin near Crested Butte, CO. This model has served as a test bed to answer many of my questions about the processes driving climate impacts in the mountains. Figure: Landcover and geology classification for the hyper-resolution East River Model. Locals to Colorado will recognize the mountain in the bottom right as Mt. Crested Butte. Comparing the spread of uncertainty in projected climate changes to the Rocky Mountains with the spread of uncertainty in model complexity. In complex terrain especially there is so much variability in projected climate impacts. How do we better understand the processes driving these predictions within our models? Are we detecting a climate signal or is the variability just variation in modeling methods? Which predicted environmental changes are robust to method and which are still too uncertain? Understanding the way measured parameters scale as resolution is coarsened from 10m up to 1km, the higher end of resolution for regional hydrologic models. Developing a mathematical method to incorporate changes in topography and slope to scale hydraulic conductivity for integrated modeling applications when a traditional calibration is too computationally expensive. Comparing observational and modeling techniques to measure and simulate snowpack. Remote sensing provides high spatial resolution of snow at snapshots in time, while point stations provide high temporal resolutions but at single locations in space. Can complex models like the above bridge the space and time gap in observational datasets? Developing meteorological forcing datasets to drive hydrologic models in a complex, data-poor region. Comparisons of off-the-shelf products to desegregating point data for temperature, precipitation, humidity, pressure, radiation, and wind observations. Comparing functional relationships within the watershed over 2 orders of magnitude, from the 10m scale to the 1km scale, and reconciling modeling results with observations.At what scale do functional relationships between key hydrological metrics (i.e. water table depth, mean discharge, peak discharge, peak SWE etc.) and watershed characteristics (i.e. landcover, topography, geology, and climate) break down? Foster, L.M., Bearup, L.A., Molotch, N.P., Brooks, P.D. and Maxwell, R.M. 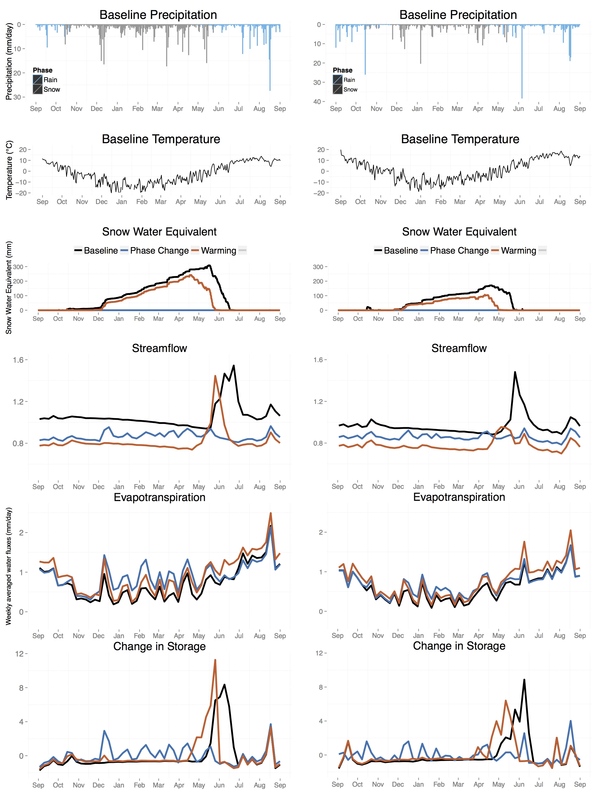 Energy Budget Increases Reduce Mean Streamflow More Than Snow-Rain Transitions: Using integrated modeling to isolate climate change impacts on Rocky Mountain hydrology. Environmental Research Letters, 11(40), doi:10.1088/1748-9326/11/4/044015, 2016. In snow-dominated mountain regions, a warming climate is expected to alter two drivers of hydrology: 1) decrease the fraction of precipitation falling as snow; and 2) increase surface energy available to drive evapotranspiration. This study uses a novel integrated modeling approach to explicitly separate energy budget increases via warming from precipitation phase transitions from snow to rain in two ideal case setups representing mountain headwaters transects of the central Rocky Mountains. Both phase transitions and energy increases had significant, though unique, impacts on semi-arid mountain hydrology in our simulations. A complete shift in precipitation from snow to rain reduced streamflow between 11 and 18%, while 4°C of uniform warming reduced streamflow between 19 and 23%, suggesting that changes in energy-driven evaporative loss, between 27 and 29% for these uniform warming scenarios, may be the dominant driver of annual mean streamflow in a warming climate. Phase changes induced a flashier system, making water availability more susceptible to precipitation variability and eliminating the runoff signature characteristic of snowmelt-dominated systems. The impact of a phase change on mean streamflow was reduced as aridity increased from west to east of the continental divide. Below is Figure 3 from the Environmental Research Letters paper, the left panel is west of the continental divide, at Pennsylvania Gulch near Breckinridge, CO, the right panel is east of the continental divide, at the North Fork of the Big Thompson River. The impact of climate change on the hydrologic system is still poorly understood. Integrated modeling provides a tool to investigate the way changes propagate through nonlinear systems. These models are driven primarily by atmospheric forcing data at coarser resolution than the models themselves, requiring simplification, downscaling, or regridding of atmospheric variables to the resolution of the hydrologic model. The uncertainty in downscaling methodologies is still poorly understood. This study investigates the range of uncertainty introduced by regridding and downscaling 4km forcing to 1km resolution on a 3500 square kilometer arid mountain domain in Colorado to determine the hydrologic sensitivity to different input variables and different methodologies. Delineating this range is critical to better understanding the magnitude of impact of climate change signals in complex terrain.